In justifying the five-year, $27.5 million that he signed defenseman Brooks Orpik to on the opening day of free agency, Washington Capitals general manager Brian MacLellan referred to the steadying presence that the then-33-year-old had been known to provide as the team's "greatest need." It's a statement that MacLellan reasserted last week during a powwow with reporters when he said the offseason additions of Orpik and fellow ex-Penguin Matt Niskanen have been "stabilizing for our defense." Not that the more statistically inclined (compared to this reporter, that is) needed any more fodder to roast MacLellan for luring Orpik to Washington. In separate posts for The Washington Post and Russian Machine Never Breaks, respectively, Patrick Holden referred to Orpik and partner John Carlson as the "NHL's worst shutdown pair" through the first month of the season and detailed how Orpik has shackled the more offensively adept Carlson. In his weekly snapshot for RMNB, Peter Hassett compared Orpik to "consensus shutdown D" in the league, concluding that Orpik is not one, but simply being "used" as one to discouraging results. In his 12th season, Orpik has frequently been utilized in a shutdown role, responsible for stymying the opposition's most dangerous offensive threats. The rise of advanced statistics has set basic parameters on how to measure a defenseman with that particular responsibility (zone starts, relative on-ice shot differential, quality of competition), but how does Orpik gauge his own success? "Those guys, you look at the best guys, they obviously get a lot of chances," Orpik said last week of the high-end skaters he typically faces. "That's why they have as many points and produce the way they do. I think the way I measure it is those guys are going to get their chances, but what kind of chances are they going to get? Making sure there are no secondary chances is a big one. "A lot of it is making sure their chances come from the outside, not the inside. Once guys get inside position on you, that's where those guys with their finishing ability usually hurt you. That's what I measure it on. Now you've got all those fancy advanced stats, which I don't completely understand." Those looking at Orpik's "fancy advanced stats" will see that he has a team-worst relative Corsi-for percentage of -7.34 percent at even strength, which simply means that the Capitals allow more shot attempts (shots on goal, missed shots, blocked shots) when Orpik is on the ice than when he isn't. Orpik, though, doesn't subscribe to that ideology. As an example, he recalled the Capitals' 3-2 victory against the Chicago Blackhawks on Nov. 7, a game in which Washington allowed a season-high 40 shots. "I think in Chicago, I think we gave up like 40 shots, but especially like [Patrick] Kane and [Jonathan] Toews, I don't think they had a lot of good looks," Orpik said. "I know they had a lot of shots from outside the circles and you ask the goalies too, that's what they want and not a lot of second chances." 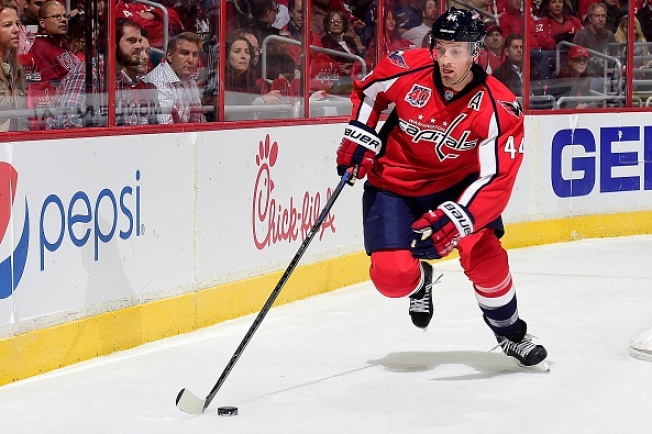 "Lot of times, just looking at like shot totals isn't a very good factor for me," Orpik said. "It's more of the quality of chances you're giving up. I don't know if they have an advanced stat for that yet. That's something that's probably, I think, a more accurate indication for defensemen."